Contractors were clearing away the barriers Friday from the completed intersection of Water and Hill. Pretty spiffy, you have to admit, looking at the newly reconstructed intersection of Water Avenue and Hill Street on Albany’s riverfront. But functional? Maybe not so much. The intersection was redone as part of the Edgewater Village housing development between Water and the Willamette River. 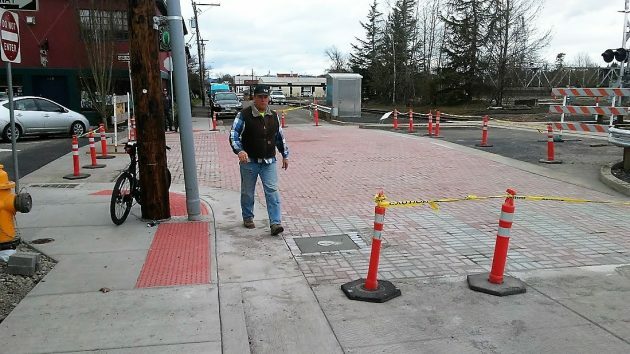 Federal highway money through ODOT covered the cost of the rail crossing upgrade — signalization, ties and concrete panels for the roadway surface — and the developer covered the street work including the colorful pavers. Installation of crossing protection at Hill required that Water Avenue be drastically narrowed. In the photo you can see the signal hut sitting in what used to be the street. Some on-street parking spots have been lost.. The street construction also meant the loss of an improvised parking lot on the north side of Water, where the city owns nearly an acre of vacant land. The installation of costly gates and signals at this crossing may puzzle people. One block to the east, the Main Street rail crossing will have no gates because the layout of the track and the streets makes it impractical. And for several blocks to the east of that, the train track runs down the middle of Water Avenue with no need for protection at all. Hill and Main streets are the only gateways at Edgewater Village, which is planned to have 58 units. Hill is one-way north between First and Water, so it’s not a convenient exit from the development even though ODOT demanded new stop signs on Water. So how much CARA money total has been given to this developer to create a subdivision of overpriced rental houses? How much of the loan has been or will be forgiven? What is so amazing about these houses that (they think) they’re worth $70 more than the median price per sq ft for the zip code? Have any of the houses ever sold? My husband and I first leased and then purchased one of the Edgewater Village homes. We love the location so close to the river and downtown. Yes, the pavers look nice! Geesh! The pavers do look nice, but I like the fact that by installing pavers it allows rain water to seep back into the ground and not just sheet flow to our storm water system and add to the yearly flood issues. Serves two purposes.